We use high quality silicone material, and has passed FDA and SGS certification. Tasteless, non-toxic, anti-dust, durable, impermeable, easy to clean. Great for making Bread Chiffon Muffin Angel Food Mousse Dessert Cake Pastry Brownies Baked cakes and more. Create a fancy bundt cake to show off to your family and friends with this unique mold. Stop worrying about a sticky pan ruining your bundt cake masterpiece with this silicon mold. Safe, flexible silicon distributes heat evenly for even, excellent baking results. 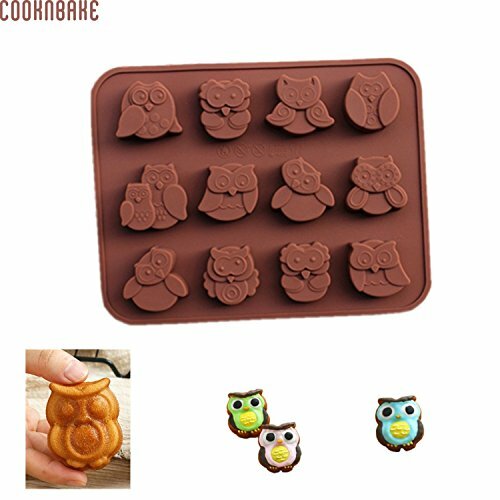 Package in clude: 1* Animal Kitchen Tool Silicone Chocolate Mold With 12 Hole. Product size: 19.3 cm * 14.9 cm * 1.5cm. Certification: CIQ, EEC, FDA, LFGB, CE / EU, SGS. We use high quality silicone material, and has passed FDA and SGS certification. The item can withstand temperature range: -40~200 degrees celsius. It's tasteless, non-toxic, anti-dust, durable, no penetration, easy to clean. It's easy to handle. Silicone mold using the ambient temperature is can be used in the microwave oven, grill, a heating plate, also can be frozen in the refrigerator freezer. Non-stick silicone mold release are particularly easy, easy, smooth, almost perfect. After baking, baking sheet, cool for 10 minutes and then release, better effect.